(Almost) everything you love about a simple LCD-screen thermostat, plus WiFi connectivity and an app! 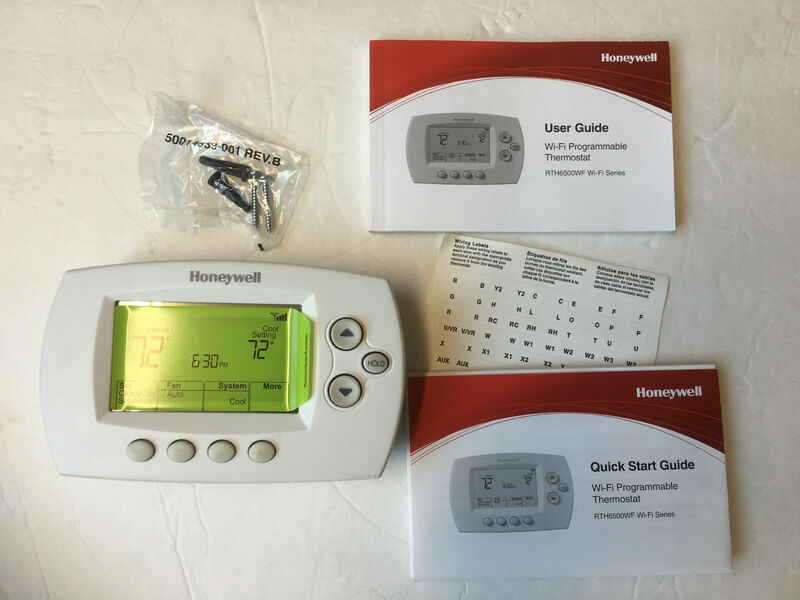 The Honeywell RTH6580WF is a good, simple, affordable WiFi thermostat. It’s for those not ready or not willing to pay $200+ for a fully featured smart thermostat, but still want the convenience of controlling their home’s temperature through their phone. The screen is basic, but that’s okay – your phone is already an excellent touch screen. The thermostat’s physical design harkens back to the 90’s, but that’s okay, too – this thermostat is probably similar in size and shape to the one already on your wall, so you may not have to repaint or repair anything after upgrading. Amazon Echo integration just added August 2016! Keep your expectations reasonable and you won’t be disappointed. The Honeywell RTH6580WF isn’t a high end thermostat, but it earns its 4 stars out of 5 for its robust feature set while still being one of the cheapest WiFi thermostats on the market. It’s easy on the budget, the app has come a long way since the the thermostat’s introduction a few years ago, and it’s got all the basic stuff you’d expect from a thermostat. There’s no need to worry if your power goes out – it’ll remember your settings. If your WiFi goes out, that’s okay, too – it’ll keep chugging along on the schedule you gave it. The only people who would be disappointed in this thermostat would be those who wanted something flashier like a Nest. 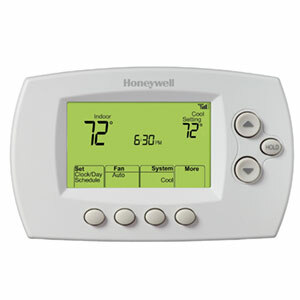 For those who just want a smart thermostat that you can “set and forget”, the Honeywell RTH6580WF’s got you covered. RTH6580WF unboxed – a wall installation plate is also included. The on-unit controls are about as clunky as those found on old school programmable thermostats, but the free iPhone/Android app is pretty sweet and the desktop portal is just as good. The app is called “Total Comfort Connect” and it’s available for free (just search your device’s app store). Set up schedules, override the current schedule, get alerts, control the temperature from far away – it’s all here. You also get a weather report and a list of locations, in case you have multiple homes/locations with Honeywell thermostats installed. Alas, this is yet another thermostat that requires a C-wire. If the comments on this site indication, a lot of homes lack the so-called “common wire”. The common wire is like a “ground” wire. The thermostat gets its power from the 24V wire (usually red), and the presence of the C-wire keeps that power continuous. Choosing the “Fan option” means you lose independent control over your HVAC system’s fan, which is kind of a janky fix to this problem, but Honeywell has a video on the process and it does get the job done. I don’t think this is the best fix, though, even if Honeywell suggests it, because it’s taking away a feature your HVAC system is supposed to have and probably confusing all future users. Before you buy, make sure the thermostat will work with your home’s wiring. 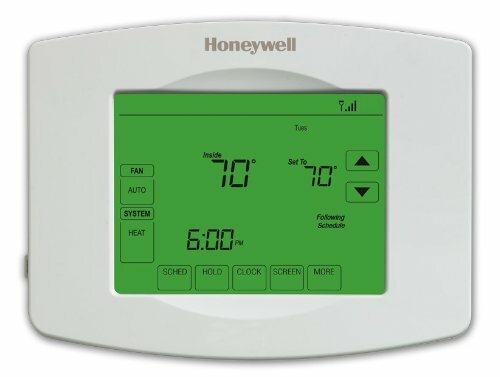 Honeywell’s website has a step-by-step assessment you can do yourself to determine if the RTH6580WF is compatible with your home’s HVAC system. Pop your current thermostat off the wall and answer each question. Does your current thermostat have 110V or higher written on it? Do you have thick wires that are connected using wire nuts? Do you have a wire connected to terminal labeled “C”? Yes: Congratulations, the RTH6580 thermostat will work with your system. Do you have an extra wire that is not connected to any terminal on the thermostat wall plate? Do you have a wire connected to terminal labeled “G”? Honeywell’s own version of this questionnaire includes photos and instructions on how to contact them if you need additional help. The on-unit display shows the current temperature and WiFi status. Press the buttons to apply an override, adjust the temperature, set the clock/day/schedule, select fan settings, and adjust other settings. 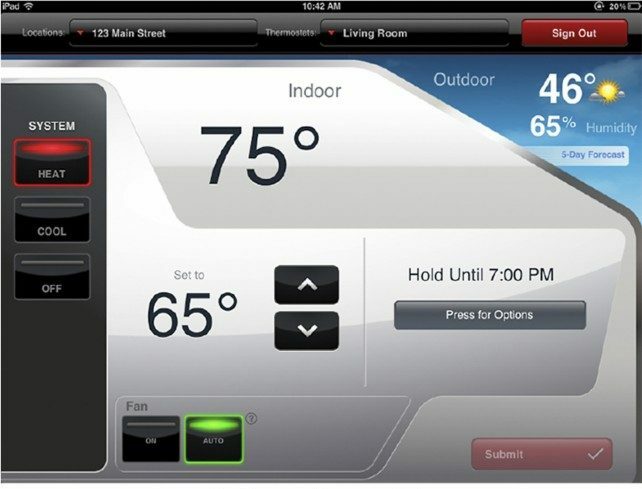 If you’ve used a programmable thermostat, then you know what to expect out of this thermostat. By default, the Honeywell RTH6580WF comes with a built-in schedule to get you started. You can toss this schedule and make your own, or tweak it to meet your needs. The temperatures in this default schedule are pretty generous, so if you aren’t sure where to start, go with this one and see how you like it. The RTH8580 (note the first digit has changed from a 6 to an 8) is basically the same thing except with a touch screen and a higher price tag. Personally, I think your phone is enough touch screen, so you can save a few bucks and just get the RTH6580WF instead of spending more for a touch screen. This is where things get more competitive. 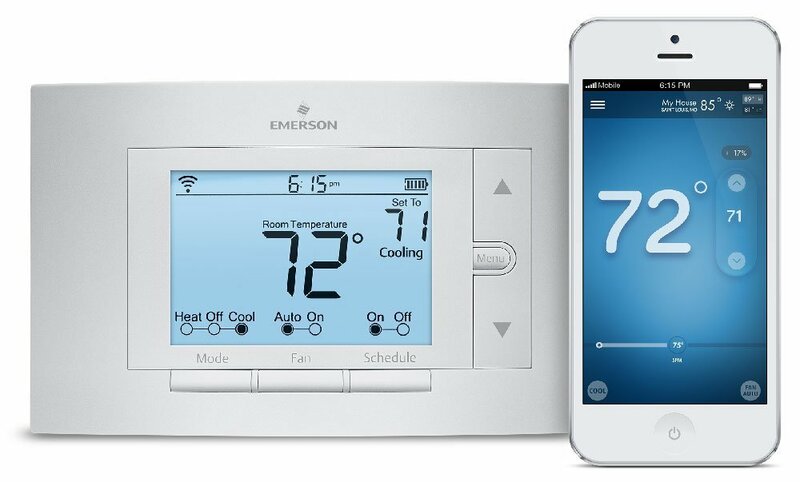 Honeywell’s RTH6580WF and the Emerson Sensi are both good choices in the “budget WiFi thermostat” category. They both have easy to use apps, can be controlled through a web portal, are integrated with Amazon’s Alexa, and are similarly compatible with a variety of systems. Read our full Emerson Sensi review here and decide for yourself. If you don’t have a C-wire but you do have heating and cooling, go with the Sensi for the least amount of installation hassle. If you have a C-wire, pick the one that better fits your budget or that you like the look of more. It’s a solid budget smart thermostat. If you’re not in the mood to spend upwards of $250 but you still want those sweet WiFi features, the RTH6580 is a great choice. 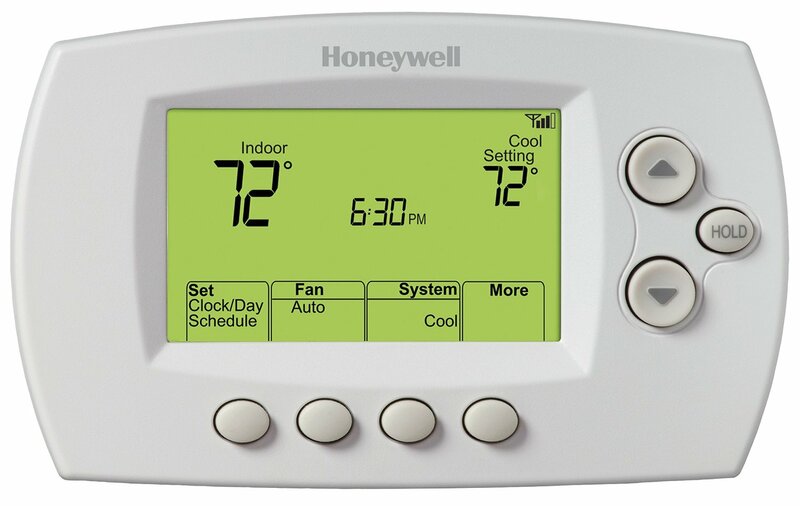 At this price point it’s not gonna “learn” your schedule or track your location, but it’s from Honeywell, one of the oldest names in thermostats, and it’s got all the conveniences and features you do want in a smart thermostat. Just make sure your wiring is compatible and you’ll be good to go. Previous: Previous post: 15% off Amazon Echo and Tap – today only! How low (temperature) can I program or use the permanent over-ride button? I believe the lowest is about 40 degrees. does the RTH 6580 WF thermostate lose its settings if the power goes out?? I purchased two of these and both ended up being defective. They both turn off the air handler during HP defrost which is about 12 minutes then the fan comes on for about 5 min then the HP restarts and eh fan resets. This all takes about 20 – 25 minutes which causes the house to loose heat. This happens every hour so I loose 35 min of heat every hour so my house drops 1 degree every hour or so. This only happens when the outside temp is below 32 degrees. Honeywell has been no help and they won’t warranty they stats as I’m over the 12 months by one month. Also it does not get below 32 but this year it has been for three days now. So the problem never showed up before. The unit is satisfactory for our needs…programmable and wifi…the price is appropriate. The instructions were extremely lacking when it came to connecting the unit to our wifi network. Ended up calling Wifi Thermostat Customer Service (855-733-5465) to get it connected, and could find nothing in the User Guide or Quick Reference that was even close to what Customer Service had us do. Customer Service was awesome and walked through all steps. Will it provide an alert to my phone if the temperature drops below a certain setting to warn me?